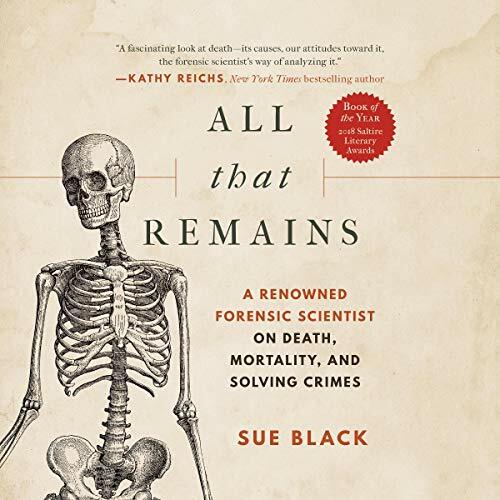 For fans of Caitlin Doughty, Mary Roach, and CSI shows, a renowned forensic scientist on death and mortality. Cutting through hype, romanticism, and cliché, she recounts her first dissection; her own first acquaintance with a loved one’s death; the mortal remains in her lab and at burial sites, as well as scenes of violence, murder, and criminal dismemberment; and about investigating mass fatalities due to war, accident, or natural disaster, such as the 2004 Indian Ocean tsunami. She uses key cases to reveal how forensic science has developed and what her work has taught her about human nature. Acclaimed by bestselling crime writers and fellow scientists alike, All That Remains is neither sad nor macabre. While Professor Black tells of tragedy, she also infuses her stories with a wicked sense of humor and much common sense. ©2018 Professor Dame Sue Black (P)2018 Brilliance Publishing, Inc., all rights reserved. This book was an interesting delight to listen to, and I hope the author and narrator work together again in future as I’d love to hear more!